It has long been a source of frustration for the Pitchfork column that so-called environmental leaders refuse to embrace eating an exclusively plant-based diet as an integral part of a larger environmental mission. I first wrote about the topic here and have since become so disillusioned with the sordid cant of conventional environmentalism that (with my tongue in my cheek a little) I recently wrote a piece arguing that it’s time for progressives to throw in the towel and forge a language of defeat. Throughout it all, my belief remains firm: we cannot eat animals and claim to care deeply enough about the environment to save it. That’s my take on the issue, in the most general terms. But a new, feature-length documentary in the works has the potential to do much more than complain about the situation and make vague assessments. 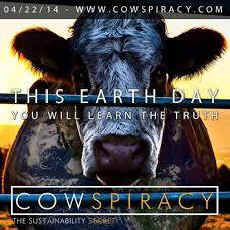 It’s called Cowspiracy and it explores the question of why mainstream environmentalism refuses to directly confront industrial agriculture. Producers Kip Anderson (Animals United Movement) and Keegan Kuhn (First Spark Media) have teamed up to do what Blackfish is currently doing to SeaWorld: radically changing pubic perception about our use of animals in an industry we have traditionally failed to identify as a source of profound ecological destruction. For better or worse, the film appears to focus on industrial animal agriculture alone but, given the alarming nature of the problem, that’s a start—one that I support.